VOLUNTEER - SIGN UP NOW!!! Gates open at 4pm; the Festival will begin at 6.30, the Pope will arrive at 7. The Festival will end around 9pm. The organisers would be happy to hear from groups/organisations working with the homeless or refugees, with a view to inviting them to attend. Ten tickets will be available to each parish in the country. The codes for these will be sent to each bishop in the coming week, and will be distributed to the parishes. The tickets will be "print-at-home" and will be linked with the email address through which they're accessed and will, therefore, be the responsibility of the person who receives the codes and prints the tickets. Any tickets not allocated by 31 July will be offered to people who will have requested them, over and above the parish or diocesan allocation. Information will be given re. parking arrangements for Croke Park. The greater the number of buses bringing attendees, the more space there'll be for parking. The plan is that people from the same diocese will be seated in the same area, in so far as that's possible. Please note: people attending any of the events should carry some form of photographic ID, and should have their tickets with them. It'll make things run a lot more smoothly. Knock is a ticket-only event. No one should go to Knock on the Sunday without a ticket. The numbers for the Papal Mass in the Phoenix Park on Sunday 26 August have been set at 500,000. So far, 178,000 people have indicated that they'll be travelling by car (approx. 60,000 cars), so parking will be at a premium. Coach drivers will be given instructions about the route they should take and where they should park. Pilgrims will be allocated a colour-coded walking route and entrance gate to the Park. Deviating from that will probably mean a refusal of entry at the gate, and advice to use the proper gate. No matter how close some people get to the Park by their means of transport, there will be some walking for everyone. The coach passes will be emailed to the person who booked the coach and/or was named as the group leader. The "Camino" may be made any time between 18 - 25 August. The MOF2018 website has all the details. Maps are available, and there'll be a special banner on the outside of each of the churches. Passports are available at the churches. Anyone registered for the Pastoral Congress will find a passport in their welcome pack. As of today, 6,600 Volunteers have registered to help. Those volunteering to act as stewards will not have to be Garda vetted, but will have their references checked out. They are still looking for stories for their "Humans of WMOF" Facebook page. The cancellation or changing of regular Sunday Masses in parishes is at the discretion of the local bishop and/or parish priest. If you know of tickets which will not be used, please get in touch with the Dublin office, so that they can allocate them to someone else. 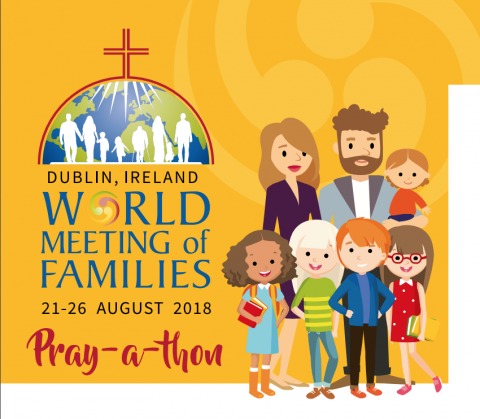 We would be grateful for any promotion that you can give to the WMOF2018 PRAY-A-THON. The PRAY-A-THON has been designed to reach out to family members/friends and pray for them and any special intentions they might have. Similar to the aim of read-a-thons, which foster the habit of regular reading, the Pray-A-Thon can encourage children in the practice of praying within the family home. Easily downloadable from the WMOF2018 website, the prayer card can be printed by schools, parishes or parents, and given to children to fold into a booklet, bring home and fill in individually. The card has space for up to 20 names for whom they will pray on each day of their Pray-A-Thon. Children are invited to pray using the words "please, thank you and I am sorry" that Pope Francis encourages us to use within our family life. On the last day, the children pray for family members or friends that have died as well as for families around the world in need. With this year's World Meeting of Families being hosted in Ireland, a new Facebook page has been set up to capture and catalogue family stories. The Facebook page is featuring stories and anecdotes about family life, past and present, from WMOF2018 staff, volunteers, diocesan and parish participants as well as those preparing to travel to WMOF2018 from other countries. These stories are linked by the theme of faith and are proving really popular on social media. These stories are human interest and are available to share from the Facebook Page 'Humans of World Meeting of Families 2018'. 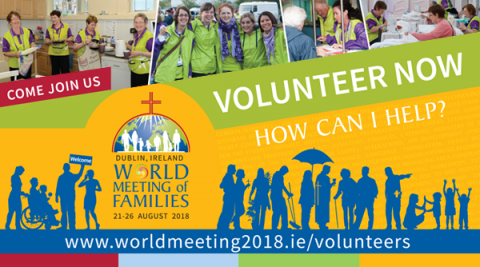 They feature volunteers, staff, delegates, families and individuals connected with the WMOF2018. Please feel free to take these and to share them.